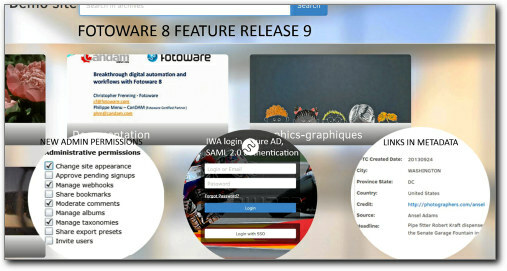 Fotoweb 8 Feature release 9 is out! Nov 10, 2016; OSLO, Norway; the Fotoweb 8 feature release 9 edition has been made available for download to all entitled customers. FR9 brings a range of fixes and improvements, as well as new features to the Fotoweb DAM. All customers with a valid SMA or initial 12 months warranty period are entitled to the free update. 1-Integrated Windows Authentication is back – formerly Single Sign-on-, as well as new authentication methods for Azure AD and SAML 2.0 preview. These new authentication schemes will allow Fotoware customers to better integrate with their internal security policies. 2-New more granular administrative permissions allow to further delegate administrative tasks to different users, without necessarily given them access to all the admin functions. 3-You may now embed html links and anchors into any Fotoweb text metadata field. Fotoweb will automatically translate the link into valid html link and allow users to click on the defined link. This opens new opportunities for automated publishing, in particular when using our Pro plugins with the metadata text templates for web publishing with WordPress, Joomla or Drupal CMS.